Hey, I've released a new update, versioned 19.0 with awesome features. Ah, I am back with a wonderful and major update on our Toggle Mod series for Mini Militia game. Ya, you could sense that right from the title "Toggle Mod COMBO". Yes, after receiving lots of complaints about delayed release of NO Root version of this app, I've decided to combine both features into a single application, which means now onward, every COMBO edition of Toggle Mod will support both Rooted and Non Rooted devices. COMBO - Now this single app would support both rooted and non rooted devices. Every Toggle Mod tagged COMBO would possess this feature. Automatic detection of Root. In-built Updater - After a long pile of messages on "where and when is the new update? ", this feature has been added to tackle those problems away. This app's in-built updater would check for new updates each and every time you open the application. Just bringing down the hassle for y'all. 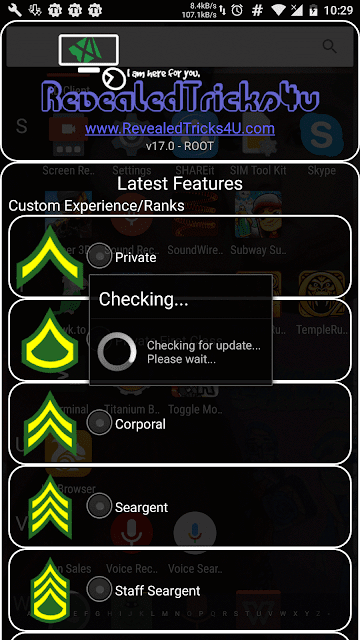 Toggle-Mod-COMBO-v18.2-RevealedTricks4U.com.apk (3.71 MB) - Click on Skip Ad after clicking this link, to get the download page. Fixed a small bug in the update checker, which would have caused an update loop. Major security bug in the code tampering mechanism module. Just deny root access, the app will automatically revert to NO ROOT mode. So that you can still enjoy the features, while I fix those bugs in the root part. Pro weapons, unlimited flying & unlimited health are not working in v18, i am unable to click on the box, Please fix it. Thanks for the mod. Pro Pack has been removed, being fair to the game developers. You could use the magic health and flying power feature instead of Unlimited ones. Thank you :). And, please be more specific on the crashing part. Very very very thanks for this awesome update feature. God bless you. Because I want jealous my friends. And the last is plz plz plz bring back both two features. Specially * unlimited flying power feature. Because it causes suicide in many levels. I m waiting for your reply. Hi Shihab bro plzzz Fix short distance range ammo bug because the ammo we fire are range very short and not going fare. Woah!, this time you came back with a hell load of list for me to work on ;). I'll do what's good for everyone and I really appreciate your time taken to compile this suggestion list. one more thing is do you plz plz totally remove advertising in this. Because when we quit it before its time during online gameplay it automatic lodes ads in next game play.plz totally remove advertising. It's up to the game developers mate. Contact them, if you're feeling annoyed by the in-game ads. plz i repuest add unlimited flying power . Thank you very much. And, I am really glad to have you as my app's user. My phone is getting mad, first time when i tried to patch, it stucked while saying patching binary with selected modification. Than luckily it got patched and everything worked smoothly perfectly. 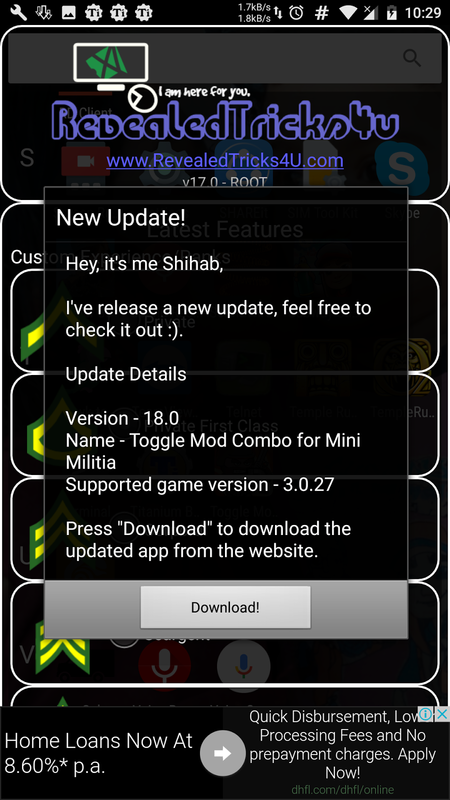 The main problem stated when i uninstalled the game and again tried to patch it, it get patches but when i press the launch game option it says UNFORTUNATELY MINI MILTIA STOPED.